Welcome to the new KQED.org. You’ll see that we’ve been hard at work redesigning and rebuilding our site to accommodate your on-the-go lifestyle. Now you can find just what you need, the moment you need it. 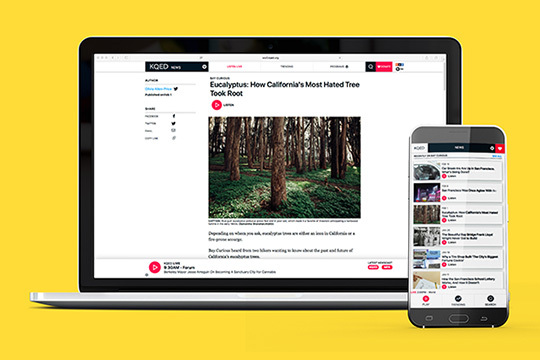 The new KQED.org site was designed with speed and convenience as top priorities. We rebuilt the site from front to back to ensure the fastest page load times possible on both laptop and mobile. After multiple prototypes and speed tests, it now exceeds our expectations. We hope to exceed yours. You can now listen with one click on any page, thanks to an audio player that rests at the bottom of your browser window. Click to tune-in to the live radio stream, hear the latest KQED and NPR newscasts, listen to your favorite podcast, or quickly find that episode or story you heard earlier. Keep listening with no disruptions as you continue browsing the site. With the flick of a thumb, you can scroll to our best stories without having to find and click to continue or wait for a new page to load. Clean article layouts showcase our storytelling in a format that makes it easy to read, watch and listen. And don’t miss our new “Trending” stories from each section — those highlight the articles that are getting the most attention from you and others in our audience in a given moment. We know that over 90% of all Internet sessions begin with search, so we overhauled the KQED.org search to be instantaneous and accurate, slicing through hundreds of thousands of programs and articles to deliver the best, most relevant results..
We’ve simplified “Sharing” so you can easily send an article to a friend or colleague, save a story link to your reader for later, or easily share on social media. News moves at a breakneck pace these days. Our banner alerts let you know immediately when there’s a breaking story or an update. KQED’s journalists bring you the important stories that keep you informed and connected to the Bay Area. Now it’s even easier to learn about who they are and what stories they’re tracking. We hope you like the new features, and your feedback will help KQED.org continue to improve. Let us know your thoughts — what we got right and what needs more work. Stay tuned: There’s more to come. This spring we’ll redesign the KQED Television and video streaming areas of our site to make KQED.org better still. Enjoy this sneak peek, and thank you.